Congratulations on making the decision to start an interesting and fulfilling career as a security guard! This field is in very high demand, so with some hard work your chances of getting a job as a security guard are excellent! The requirements for security guard training in Canada vary from province to province. Please select your province/territory below to full information on security guard training requirements for both unarmed and armed security guards. The main objective of a security officer is to protect. Whether it's people, places, property or assets – a security officer's duty is an extremely important one, which is why the protection services industry is one of the most popular among job seekers today. Most are employed through private companies that are hired by those who seek protection. No matter what part of the world you may live in, there's always a demand for keeping watch, however training requirements and regulations vary from province to province, and country to country as well. The job description for a security officer will vary depending on what type of position one is applying for. 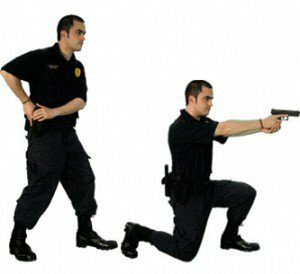 For example, an unarmed guard will have different sets of responsibilities than an armed guard – one who carries a firearm while on duty. Some officers will be assigned to specific patrol routes, while others will be assigned to static posts. As previously mentioned, the demand for well trained people in the security field is extremely high. As long as you meet the qualifications and have completed the proper training (and again, training requirements vary by province), you have a great chance of getting hired. Most provinces/territories require that you first get a license before you seek employment as a security guard/officer. In some provinces you can begin work without completing the course but only have a set time frame to complete the required instruction. If you don't meet that timeline you can not be employed as a security officer. This is just a one time exception so you can't jump from company to company without the proper training. It is best to check out the specific requirements for each province by reading the reports that can be found under the “Provincial Requirements” link in the menu bar above. After starting out as an entry level security guard, you may be offered to the chance at additional training to obtain a license or permit to carry a firearm while on duty. You must understand that in Canada it is very difficult to obtain a permit to carry a weapon on the job. There are more intensive background checks and quite rigorous training required to obtain the necessary permits. Generally speaking every applicant for an armed guard licence must produce proof that they are a holder of a valid Possession and Acquisition Licence (PAL) and an Authorization to Carry (ATC) pursuant to the Firearms Act. In addition to the training on the range, basic knowledge about weapons handling, safety, and most importantly – when you are and are not allowed to use a weapon (i.e. the law), will be taught. After you have completed this training your job opportunities will increase as this is a very specialized job and therefore the pay will also be higher. Toronto is a hotbed for the security industry. When you think about how many different companies and properties there are in Toronto/GTA that need a team of trained people to keep everything safe (especially after the attacks on Parliament Hill and attempted attacks on VIA Rail), it becomes obvious. Unarmed security guard training in Toronto (and all of Ontario) involves a 40-hour training course (including certification in Emergency First Aid/CPR), which you must first complete the security guard classes and then pass a written before applying for a license. These steps must be completed before you can become employed. 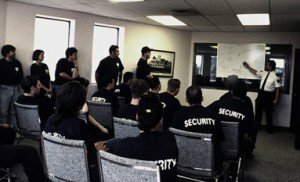 Feel free to read our post about security guard training in Toronto for more detailed information. Many provinces allow people interested in taking security officer training to take the training online, and while these are usually the most basic, entry-level courses they are designed to satisfy the requirements to obtain a security guard licence. This can be a convenient way to, in the comfort of your own home, pass the exam necessary in order to obtain your license which will then allow you to get a job. Again, it depends on where you live, because online courses aren't always accepted. Make sure that if you do live in a province that allows online training, that it's from a training company that is certified by the province that you will be working in. You will find links to approved online training providers on the individual pages for each province (if online training is allowed). In some cases, training done in one province can be accepted in another province but there is no guarantee. Make sure you check with the proper authorities before taking the training if you are planning on moving in the near future. It is always better to take the security guard training in the province that you will be working in.